The IRS recently announced it has over $1 billion in unclaimed refunds from tax returns that were due three years ago. This is an annual problem in the United States as millions of taxpayers avoided filing a tax return because they believed they were not due anything. If they only knew! Here are some steps to help guide you in claiming those unclaimed refunds. 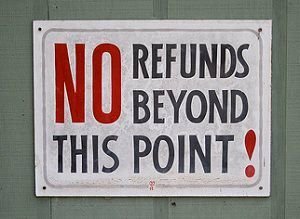 If you didn’t file a tax return for a given year, you probably want to file a return (or at least run the numbers through some tax software) to see if a refund is owed to you. If you did file a return, you may still be owed a return because you didn’t file your taxes appropriately. Doing a tax review with a professional that covers several years of returns at a time can insure you have maximized your refund for a given year. If you need to file a return you will have to go back and find the appropriate tax documents for the year you are filing for. Tax forms like a W-2 will be needed in order to file an accurate return. It’s hard to go back and find those documents if you haven’t kept your tax records well organized. You can’t go back in the past to organize your files, but do make changes to your paperwork organization today to avoid problems in the future. This also helps protect you if you get audited: you will have all the necessary documents handy rather than scrambling to find them. Did you know that your tax refunds have an expiration date? The reason the IRS is announcing they have over $1 billion in unpaid refunds from three years ago is that after three years, they get to keep the unclaimed refunds. For example, tax returns for the 2008 tax year were due in April 2009. You have three years from that tax year’s filing deadline to claim your refund. So if April 15, 2009 was the original filing deadline, you have until April 15, 2012 to claim any refund owed to you. For the 2008 tax year the IRS says the average refund amount is $637. Spread out over $1 billion means there are over 1.5 million tax payers that didn’t file a return and didn’t receive their refund that year. Even if you filed a full tax return every year as you are supposed to, you may still be due an extra refund amount. The most common reason this happens is due to bad math on the part of the taxpayer who does their own taxes. Even some tax software can be inaccurate. Review your tax returns on your own or with a tax professional. If you find errors (positive or negative) on your returns, you will need to file an amended tax return. You can file an amended return at any point after filing a normal return, but you will only be paid out any extra refund if you file the amended return during the three year window. @Jenna – They keep the money. It’s a little known fact that people sometimes don’t realise that they have money owed to them. The tax system is sooooo complex that it is logical that at some point the tax system is likely to have made a mistake and I agree that it’s best to check rather than to rely on the government to tell you! What does the IRS do with those unclaimed funds after 3 years?